Once again Spring has come to Çatalhöyük! We’ve removed all the snow and icicles and the tell is green and grassy. Work has started up again, and we’re lucky enough to have a class dedicated to “Serious Games” working on the site, as well as undergraduate research apprentices through Berkeley’s URAP program. We have a number of great projects planned, including exploring some of the new ideas about architecture that came up during the 2009 field season with wooden floors and second (and third!) stories on the houses. We have never had such a large group working on the island before, so we started to formalize some of our procedures. 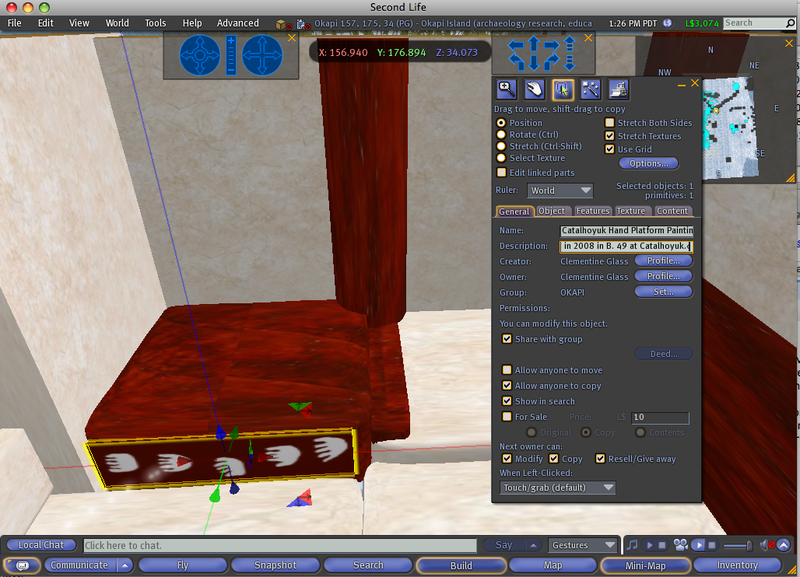 While we may elaborate on the document at a later time, here is our Archaeological Building Protocol for Second Life. 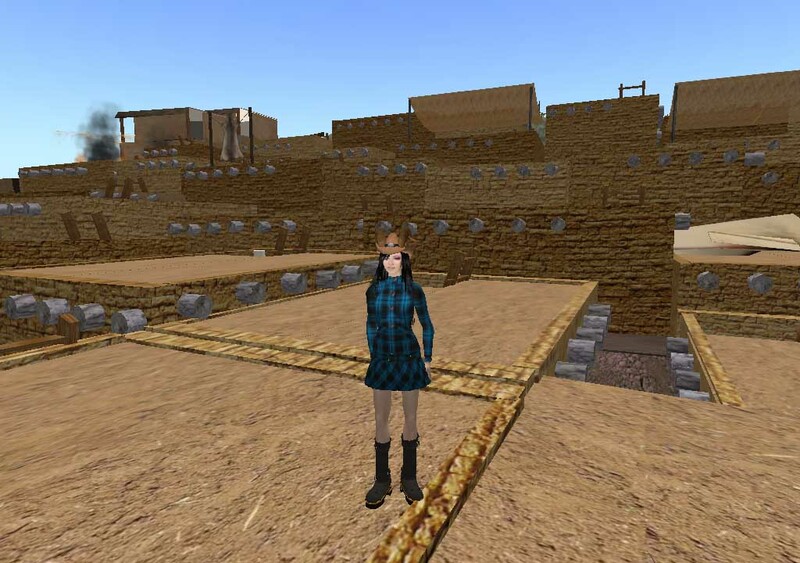 Building archaeological sites and objects in Second Life can be a powerful visualization tool for archaeological research. On OKAPI island we strive to further archaeological visualization while integrating a substantial public outreach component to our research. In Second Life, as with all archaeological reconstructions, it is especially important to maintain interpretive transparency and authorship. Additionally, we work in a large and changing research team and need to maintain the ability to edit all objects on the island to preserve existing work as the team changes. To this end, we have established building protocols for building on OKAPI island in Second Life. We believe that these protocols not only apply to our particular reconstruction, but should be applied more broadly for archaeological site construction using the Second Life toolkit. By applying these protocols a maximum of contextual information, authorship, and interpretive surety is maintained. Additionally, we believe that all objects should be copyable generally, and specifically repackaged for consumption and use off the island. In this way, our work and interpretations live beyond the relatively limited life of this particular reconstruction. Description: Short interpretive paragraph, followed by specific image or text citation. In other exciting news, the Archaeologies article is live! It is on Springer’s Online First section and it should be Open Access. Please let me know if you have any problems downloading the pdf. In a fit of structured procrastination, I decided to go through my blog links today and add a few blogs links that have been emailed to me or that I’ve noticed and delete a few of the blogs that haven’t been updated for a while. There’s been a huge increase in archaeology blogs lately and I don’t pretend to have a list of all of them (I tend to prefer blogs that talk about personal research interests and methodology) but if I’ve missed any good links, please let me know about them. I’m quite enjoying Archaeopix and their reblogging of archaeology photos available under a creative commons license. I’m lazy about adding my flickr photos to groups, so they give me motivation to be a better flickr user. Archaeopop is another new kid on the block, and is the work of a few grad students from the University of Michigan. Fun to read for interesting takes on archaeology news. I remember finding it a while ago, but for some reason I didn’t link Punk Archaeology. It’s a topic close to my heart (and will be posting an abstract that I sent off in a bit that is related), but more for investigating the DIY ethos in relation to my own work than investigating specific archaeology/punk band linkage. Another blog that has been around for a while, The Archaeology of the Mediterranean World, is one that I’ve read but never linked to out of sheer negligence. Fixed! I’ll be watching Sexyarchaeology with interest, though a “sexiest field crew” competition makes me a bit uncomfortable. I’ve been working in relatively conservative communities for too long, it seems. Archaeozoology, after a year of no updates. I was never quite sure who was running Archaeozoology, but I quite liked their posts on Cat Domestication and Islamic Pig Prohibition. Archeduct, what happened with the Loretten dig? Nomadic Thoughts, with a rather cryptic last entry. I really miss Random Transect, for their geographic proximity and interest in labor and class issues in archaeology. As for my own online presence, I’m up to 12 regular blogs that are updated (with more or considerably less frequency) and three tumblr blogs, which is perhaps a bit much. Most of them are project related though, so they don’t get updated when I’m not currently working on that particular project. One of the tumblr blogs is actually for a class that Ruth and I are teaching this semester and it serves pretty brilliantly so far for that purpose–we’re teaching archaeology and the media again, with the film emphasis, so when films are mentioned in class or in assignments, we can link to clips without too much trouble. I’ve never had much luck with class blogs, but tumblr is a low-investment linking tool that compliments the content of the class nicely. It’s somewhat opaque to outside viewers, but that’s okay. If it’s a huge success, I’ll blog about it at the end of the semester. A joint team of archaeologists from the University of California, Berkeley and Sonoma State University are examining a collection of artifacts and skeletal material excavated in Bahrain and Eastern Saudi Arabia in the 1940s and curated in the Phoebe A. Hearst Museum. This collection has hereto remained un-investigated since the time of Cornwall’s Harvard dissertation. Motivated by modern innovations in the examination of skeletal materials and a greater awareness of broader Near Eastern history, we are considering this collection from a contemporary bioarchaeological perspective as well as in terms of the personal history of Peter B. Cornwall and his team. During this process we have attempted to raise public interest in the project, while remaining sensitive to the issues regarding the depiction and documentation of the remains of past peoples. In making our research methodology more transparent through this digital documentation and presentation, we hope to distribute awareness of the Cornwall collection across a number of online platforms in a non-traditional format. In this paper we critically examine the tensions between access to museum collections and respectful digital remediation of assemblages involving human remains. Pretty standard stuff, right? Well, I’ve had to address a few more issues that have come up since. The Phoebe A. Hearst museum was last in the news in late 2008 when the unit handling some of the Native American human remains was disbanded. There is continuing protest and interest in related matters being blogged about here. At the time, many of the graduate students did not really know what was going on (with a few exceptions) and we were told a few different stories. Fast-forward to a couple of weeks ago, when the San Francisco Chronicle ran a front-page story on Japanese war dead remains that were in the museum, in apparent contradiction to the Geneva conventions. And, indeed, article 17 of the Geneva Convention of 1949 states that the war dead must be honorably interred and their graves must be respected. I did not expect that I’d be citing international humanitarian law when I wrote up my little abstract last year, and I’m still trying to sort out exactly how to contextualize our research on 4,000 year old human remains from Dilmun tumuli in Bahrain and Saudi Arabia within this dialogue on museum ethics. The good people over at the Museum Anthropology blog have a great series of posts on the topic, (here, here, and here) and end with a very valid question: Why do people think so differently about Native American human remains? I am certainly not the best equipped person to answer the question, but I feel like it’s an issue that anyone working in North America has to contend with. While I don’t work in the States for my dissertation, two summers ago I took some contract work with a local company that is part owned by a member of one of the local tribes and excavated prehistoric Native American remains in a rescue context. These remains were later buried. I don’t really have a problem with what I did, other than some of the methodology employed–I would have liked to excavate the site more generally and more fully, so we could understand the context of the burials a bit better. Some of my colleagues state that they’d never excavate human remains, in North America or anywhere else in the world. So, like so many other things, it’s complicated. We’ve drafted an ethics statement for our research on the collection and it has made us ask some hard questions about the recovery of these bones and stakeholders who may be interested in our research. I’ll post the entire paper later if possible–it’s going to be published in the proceedings and some publishers are still hesitant to have pre-prints available on the web.